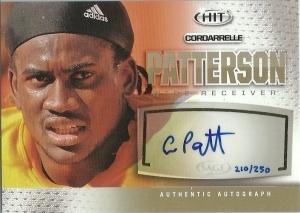 A boom or bust product since he blew up the college scene, Cordarrelle Patterson was one of the top ranked recruits in the country. Forced to hone his skills at the JUCO level, he again emerged as the top ranked JUCO product and transferred to Tennessee for 2012. Stepping into the starting lineup he blew by opposing offenses as a receiver, return man, and runningback, shattering school records for all-purpose yards, and SEC marks for combined kick and punt return average. Considered a raw talent due to his lack of true college experience, his underwhelming blocking skills, and difficulty managing physical cover men, Patterson ended up being the 29th pick of the first round of the 2013 NFL draft by the Minnesota Vikings. Cordarrelle had a strong rookie season as an electric play maker for the team, stepping in and replacing former incumbent wide receiver Percy Harvin’s all-purpose role. Patterson would record the longest TD in NFL history on a 109 yard kick off return, and was the first player to have a 100+ yard kickoff, a 75+ yard TD catch, and a 50+ yard TD run in one season. He finished his rookie season with 1,393 yards on 43 kick returns, an impressive 32.9 yard average, and 2 TDs. Cordarrelle also contributed 12 carries for 158 yards and 3 TDs on the ground, while catching 45 passes for 469 yards and 4 TDs. Although many fantasy websites were abuzz with Patterson as the hot sleeper name from the 2013 season to own, Patterson’s 2014 was plagued by inconsistent play. Still Patterson shows proven value on the market as the Texans inquired about his availability after the Vikings traded for receiver Mike Wallace during the 2015 off season.